The number of people divorcing in later life has been increasing at a time when divorce rates overall have been falling. What's behind the phenomenon of the "silver splitters"? "When I proposed to her, I almost straight away regretted having done that." But the engagement was announced on the front page of his local paper and Peter felt he couldn't back out. "I was weak-willed at the time," he says. Peter married in 1967. Thirty-six years later, at the age of 64, he did back out. "I just bundled what I could into the car and went. I do remember her standing on the doorstep. And I did feel sorry - even guilty - then that I was hurting her, really." It's the kind of private moment of pain that's part of a national trend. Divorce among people aged 60 and over in England and Wales has risen since the 1990s, according to the Office of National Statistics - while among the rest of the population, it has fallen (with a slight rise in 2012). In 2011, nearly 9,500 men in this age group divorced - an increase of almost three-quarters compared with 20 years earlier. The trend for women is similar. And it's not just because there are more older people now. The catalyst for Peter was a relationship he started with his piano partner, Anne. Practising duets for the church choir, they fell in love. "We are good friends, and that's something I didn't have with my first husband," says Anne, who ended her first marriage when she was in her 50s. "And we can laugh when things go wrong." Research suggests a big driver of the increase in "silver splitters" is increasing life expectancy. Listen to the report on the PM programme, on Radio 4 at 17:00 on Tuesday 10 November 2015. And people want more from their retirement, according to solicitor Karin Walker, of law firm KGW Family Law in Woking and the family law association, Resolution. "People are looking very much at the latter third of their life and what they want to do with it," she says. "Certainly clients I've had say they want to take up a pastime they've not done before - perhaps cycling or travelling. And very often their spouse isn't keen to participate in that, and that can cause friction and a parting of ways." Age gaps can put marriages under strain in later life, according to Barbara Bloomfield, a counsellor for Relate in Bristol and the counselling supervisor at Relate Cymru. "Let's say there's a 10-year age gap. Ten years is nothing, it's flattering, when you're 20 and 30. When you're 70 and 80 it's a totally different thing," she says. Another factor is wealth. The baby boomers tend to have good pensions. Their property's worth a lot. 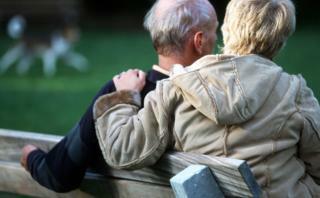 They can more afford to divorce in retirement than people used to be able to. "From the point of view of wives as well, where hitherto the wife really couldn't find herself in a position to leave home - those first 24 hours where she didn't know where to stay, didn't have any money to pay for a hotel - it all became rather daunting," says Walker, "whereas now women are much more financially independent and are much better able to take control of their lives." David, not his real name, was 70 when his wife of the same age packed a bag and left. "You go through phases - anger, you go through regret, you feel discarded as a husband, you feel you perhaps should have done a bit more and talked, but it takes two to talk and that didn't happen." He believes the suicide of their son, a number of years earlier, and episodes of ill health may have taken their toll on the relationship. "She'd been unhappy for years and I hadn't noticed, and therefore she wanted to have financial independence - a clean break, and go and live on her own." Walker says divorcing in your 60s or 70s can create more discord in families than if it had happened earlier in the marriage. She thinks children can take it worse when they're adults. "I worry about loneliness," says Dame Esther Rantzen, the founder of Silver Line, the helpline for older people. She suspects this is an issue causing more pain to older divorcees than may be apparent. "When they're taking this big step, they may be losing more than they realise. They may also be losing contact with their children, because divorce often means people side with one parent or another. "And in all this, I think there is certain amount of stigma. They feel ashamed that that sacred pledge they made those years ago they haven't fulfilled. They're not staying together 'til death us do part' and this may mean they're ashamed to ask for help. Let's discuss it, and say this is one of the things that happen when you get older." Peter is happy with his new life with Anne, whom he married in 2011, when he was 72. But his divorce came at a cost. Relations with some of his family are now tricky. "If somebody came to me now, before they'd left their wife, asking what they should do I think my answer would be see if you can make it work, in other words don't do what I did." Listen to the report on the PM programme.